To register for retreats please first contact us by e-mail or phone to ensure there is space in the program. The registration fee for each retreat is stated in the Calendar Page next to each event. The fee covers all meals, lodging, yoga, meditation, Transformational Breathwork, and psychospiritual processing sessions but does not include the 9% Maine tax on the meals & lodging portion. There are no taxes on the retreats Kieve, Italy and Mexico. When you are contacted that space is available, you may register for the retreat by paying a non-refundable, non-transferable deposit of $300 for the Maine Retreats or $500 for the Mexico Retreat and full paymenet for the Italy Retreat by Visa or Mastercard with our convenient and secure online payment system. Click the Payment button on this page under the Visa and MasterCard logos to be taken to the secure site protected by Authorize.net. Upon online payment you will receive an automatically generated receipt by e-mail followed by a confirmation letter from Rolling Meadows. The balance is due 60 days before the retreat is scheduled to begin for Maine retreats, December 15, 2019 for the Yelapa, Mexico Retreat and payment in full upon registration for the Italy retreat. All payments are non-refundable and non-transferable. Medical Insurance: Each participant is responsible for checking with their current health insurance provider and insuring that they have adequate medical coverage. Travel insurance generally offers medical insurance. The link to this site might be a place to investigate this option. Please note that this insurance is not mandatory. You may also pay by check mailed to the address below. When Payment is Received: Once we receive your deposit or final payment, we will e-mail or send a confirmation letter. Cancellation Policy: Deposits and balances paid are non-refundable and non-transferable. Some people purchase travel insurance as a protection in the event of a necessary cancelation. You might look here to investigate this. Frequently asked questions for Maine Retreats: Please go here. Meals: We serve a variety of healthy vegetarian meals. We ask you to let us know if you have any food allergies that we need to be aware of or special dietary needs. Please let us know at least two weeks in advance of your stay. What to Bring for the Maine Yoga Retreats: We have blankets, mats and sitting cushions so no need to bring them. Linens and towels are provided. Layered relaxed clothing for yoga and meditation. Warm outdoor clothing and/or rain gear for walking. Meditation shawl or blanket. Personal toiletries. Personal water bottle. A watch or clock. A journal and pen. A bathrobe to wear to and from the sauna or to bathrooms and “slippers.” In Summer: sun block, a hat, bathing suit. All seasons : good walking shoes or boots. Weather in Maine: Summer 60’s to mid-80’s with cooler nights – walking sandals, light jacket, light sweater or sweatshirt for cooler nights. Fall and Spring 20’s to 50’s – mid-weight jacket, hat, gloves, waterproof boots. What not to Bring: We request that guests do not bring cell phones, personal computers, pets, alcohol, non-prescription drugs, or wear scented body products, as we want to provide a fragrance-free environment for all. We will collect computer devices and phones the first evening of the retreat and keep them in a secure place in the office. Smoking is not permitted at the Center, or on the grounds. 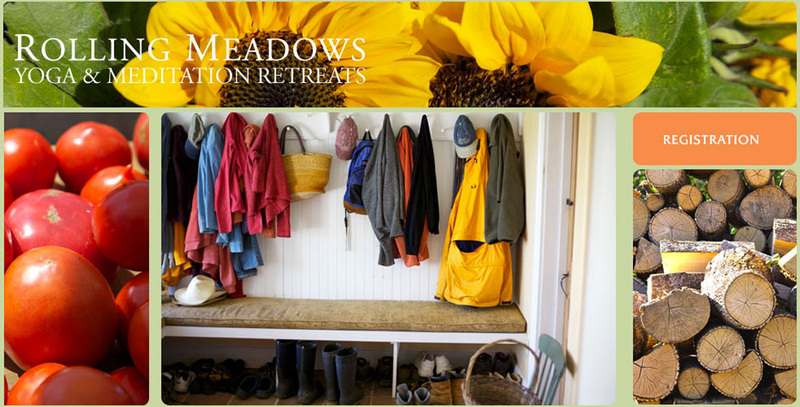 For Maine Retreats at Rolling Meadows: Arrival time: Between 4 and 6 pm on the first day of the retreat. We strongly encourage participants to be here for the evening meal on the first day at 6pm and we require that you remain on retreat until it concludes after the final session the last day of the retreat. Departure time: After the morning session and breakfast the last day of the retreat. The morning session on the last day is 7:30 – 9:00 am. We ask that you remain on retreat until it concludes after the final session the last day of the retreat. Please make travel arrangements accordingly.